In physics, we seek Grand Unification, also known as the Theory of Everything. The Standard Model describes three out of the four fundamental forces: the strong (nuclear) force, the weak force (beta decay), and the electromagnetic force. The gravitational force, described by the General Theory of Relativity, does not fit into the Standard Model. Developing a quantum theory of gravity, and unifying gravity with the other three forces is the holy grail of theoretical physics. Jewish people are also in need of Grand Unification. There is a schism that runs through the history: it is the schism between Joseph (Yosef) and Judah (Yehuda). Judah represents a “shtetl yid,” a Jew who lives in a ghetto, who sits in a yeshivah, who learns Torah, and who sees the world outside as hostile, as a dangerous place. Judah is afraid of foreign influences, of assimilation. Joseph, on the other hand, does not hesitate to venture into the world. He can embrace the world without losing his Jewish identity. He can run Egypt while remaining a committed Jew. This schism goes back to the rivalry of Rachel and Leah, to the division between the “higher waters” (mayim elyonim) and the “lower waters” (mayim tachtonim) separated on the second day of creation. This schism extends all the way into the spiritual realm, where there is a division between Partzuf Rachel and Partzuf Leah, representing respectively the world of speech (olam hadibur) and the world of thought (olam hamachshava), or the revealed realm (olam d’isgalia) and the hidden realm (olam d’iskasia). There were two men in the history who combined within themselves both aspects without internal conflict: the first man, Adam HaRishon, and our patriarch Jacob, who was Adam’s reincarnation (gilgul). Jacob’s children, however, split into two camps and that schism continued throughout the Jewish history until the present time. We just celebrated the holiday of Chanukah, which is often described as the victory of Jewish people over Greeks who oppressed them. Truth be told, it was mostly a civil war between the Zealots (the spiritual descendants of Judah) and Hellenists (the spiritual descendants of Joseph who perverted Joseph’s approach and went too far embracing foreign culture at the expense of Jewish values). That is why on Chanukah, we mostly celebrate the miracle of Temple Menorah rather than the victory of Zealots over Hellenists. No matter who wins, a civil war is always a tragedy. The biggest tragedy happened when Jewish people split into two kingdoms: the kingdom of Judah and the kingdom and of Israel, which resulted in the destruction of the latter in the loss of ten tribes of Israel. This schism will continue until the coming of Mashiach—the Jewish Messiah. Remarkably, the prophets tell us that there will be two messiahs: Mashiach ben Yoseph (Messiah, the son of Joseph), who will be killed or will die anyway before accomplishing the complete redemption of the Jewish people, and Mashiach ben David (Messiah, the son of David) who will gather Jewish people in Israel and rebuild the Third Temple (Bet HaMikdash HaShlishi). There are hints in the Prophets that Mashiach ben Yoseph and Mashiach ben David may be the same person, who will first die and then be soon resurrected to complete the job. That suggests that Mashiach will be the third person to combine within himself two aspects of the Jewish nation—the aspect of Joseph and the aspect of Judah (because David was a descendant of Judah)—without a conflict. 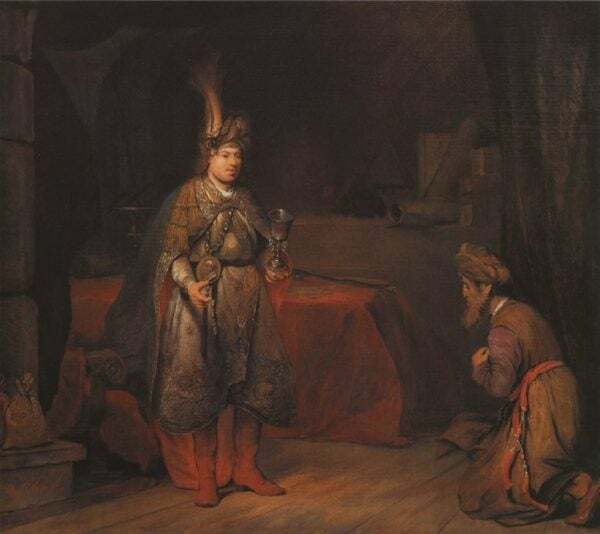 The Torah portion of Vayigash tells about the confrontation between Joseph and Judah who stood up for his younger half-brother, Benjamin, who was the only brother of Joseph. Judah’s act of self-sacrifice (offering himself to slavery instead of Benjamin) was an incredible act of Ahavat Yisrael—the love among Jewish people—which moved Joseph to reveal himself to his brothers. The sooner we embrace each other as brothers and sisters, the sooner we eradicate all divisions and quarrels (machloket) among us, the sooner we become “one nation in the land upon the mountains of Israel, and one king (King Mashiach) shall be to them all as a king.” This is a Jewish version of Grand Unification.